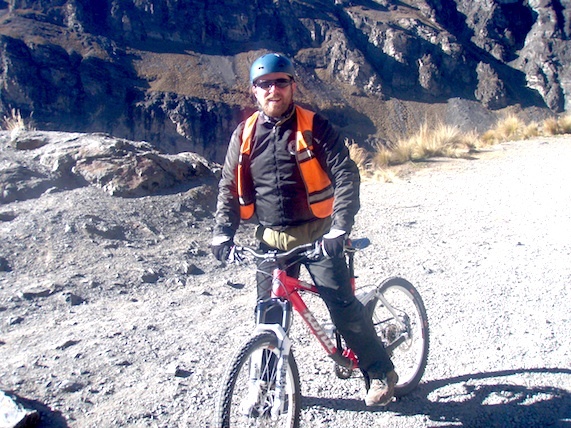 La Paz: I am not a natural cyclist. Back home, I have a bike with a basket on the front and nice comfortably high handlebars so I can sit up while I ride. I make short journeys on it (if the weather’s good and the route doesn’t involve any steep hills) to buy groceries or visit friends locally. But I have yet to learn, for example, how to turn my head to check for oncoming buses without also steering my bike into the scary traffic, or how to raise my arm to indicate without wobbling dangerously and falling over. 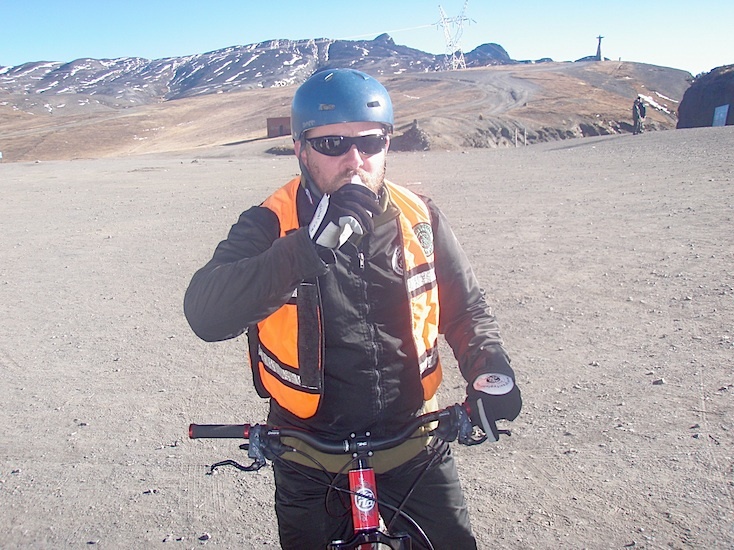 So it’s with no little apprehension that I find myself astride a mountain bike, 4700 metres up at La Cumbre, the start of The World’s Most Dangerous Road. Nick’s bouncing happily on his bike, talking about dual suspension and disc brakes and other technical stuff, while I’m trying to work out which way round my helmet goes on. Even I can see these are good bikes, though. They have nice fat tyres (fully pumped), the brakes work well and they have gears that don’t require my cycling backwards to engage them. 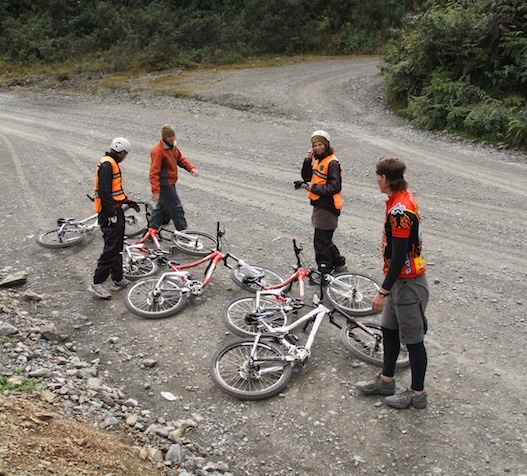 Plus we have two enthusiastic blond Americans to guide us, who are cheerful in a way that only young Americans can be, and even though they ride this route every day, it seems churlish to deny them today’s fun by wimping out before we’ve even begun. Observing the ritualistic slurp of 96% proof whisky, plus a dash on the tyres for luck, Nick and I set off in a reassuring guide-sandwich down El Camino de la Muerte (the Road of Death), hoping to survive the next five hours. 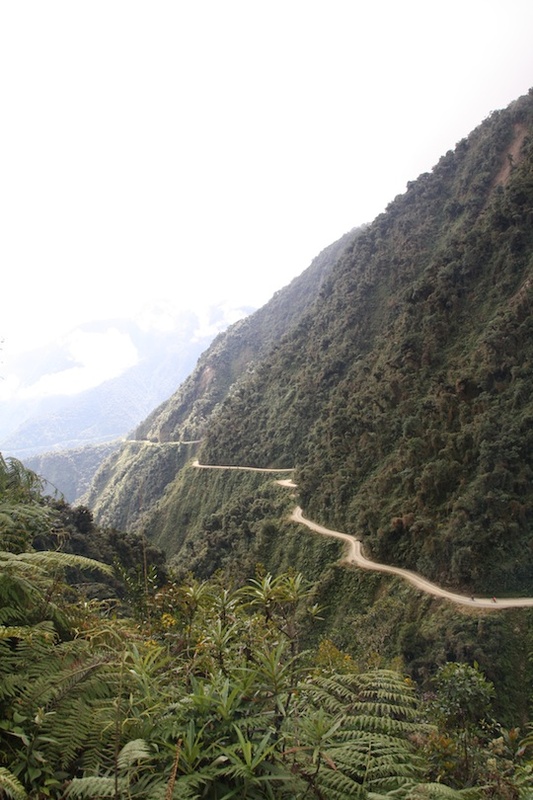 The road maps an incredible path from the capital, La Paz, across the snow-capped Yungas to the Amazon basin in the north. It got its moniker during its construction due to the high numbers of fatalities among the Paraguayan prisoners of war who were building it. The road was built during Bolivia’s ill-fated war with Paraguay in the early 1930s, over territory in the Chaco district, which both countries presumed was rich in oil. Major oil companies, including Standard and Shell took sides and helped fund the conflict, which in common to pretty much all of its international wars, Bolivia lost. It turned out that there was no oil in Chaco, so South America’s bloodiest 20th century conflict (at least 100,000 causalities) was even more unnecessary than most – although it did result in a new road across the Yungas. 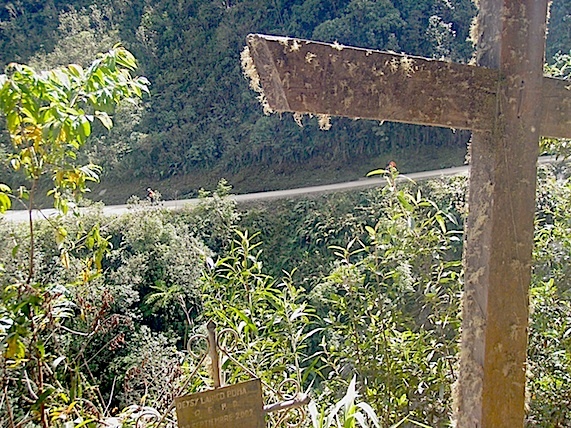 The road is now more famous for killing Bolivians than Paraguayans. 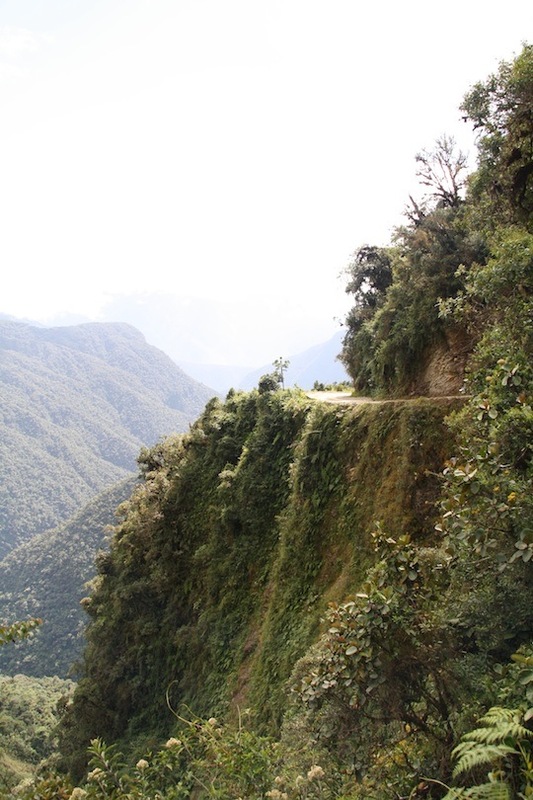 At just 64 kilometres long the Death Road killed almost 300 people a year, on average a vehicle a fortnight, earning it the unfortunate status of being the world’s most dangerous road in a 1995 assessment by the Inter-American Development Bank. 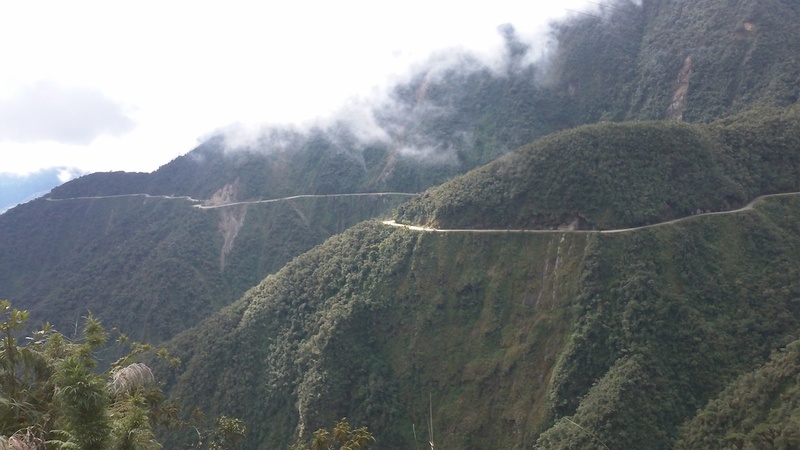 The single-lane highway, which averages just 3 metres in width, drops steeply from 4700 to 1200 metres over less than 50 miles and is a poorly maintained path of hairpin bends that wind along the mountains, featuring vertiginous drops of 800 metres or more. Buses, too long to make the tight turns, have to reverse up in 3-point turns, with their rear ends hanging terrifyingly over the edge. Waterfalls line the route, increasing erosion, landslides and making the muddy road surface still more perilous. Fog, rain and traffic make the road even more dangerous, especially during the November to April rains (when most deaths occur). But it is perhaps the kamikaze drivers, drinking through habit or superstition, taking crazy risks in unroadworthy vehicles and overtaking each other on blind corners that produced such spectacular road death rates. 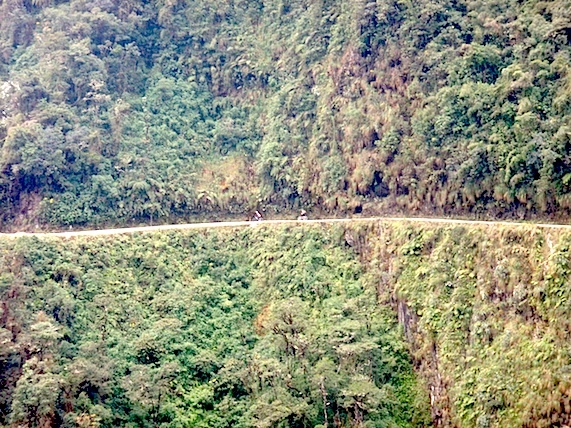 In 2007, a new road was opened that bypasses the Death Road and the majority of traffic and buses take that now. 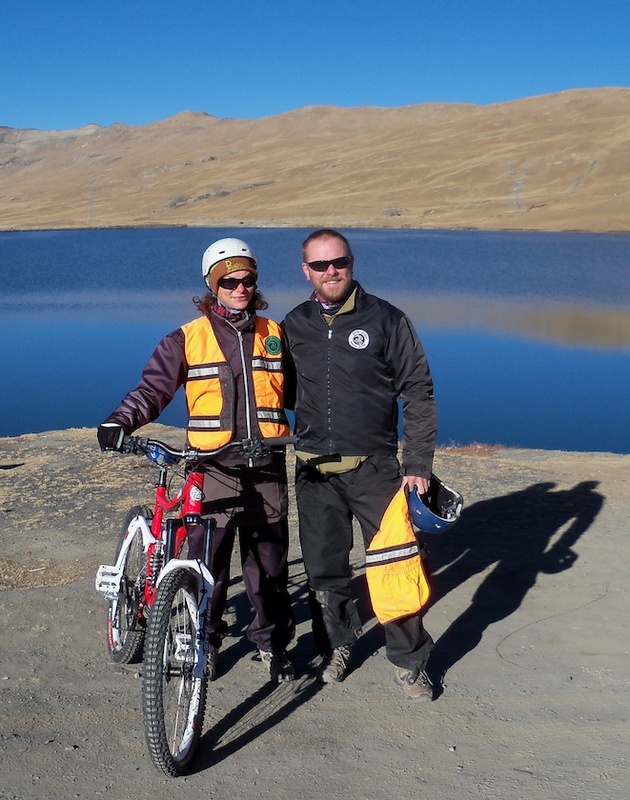 The WMDR is now mainly used by bike companies taking tourists like us. Cycling the first stretch was easy enough for me to begin to have fun on the bike. The section is new tarmac for a start, and two lanes are clearly marked. Glaciers and snow line the road, the air is freezing but the views so expansive that it’s more than worth the discomfort. Nick sails on far ahead like a small blob perched on a spindle. I am getting cramps in my hands from the permanent brake squeeze, but I’m not about to loosen my grip. Poor American Cody, forced to ride at perhaps his slowest ever pace, smiles encouragingly every time I stop to clear dust from my sunglasses or warm my frozen fingers or some other excuse to rest. We stop frequently, though. Sometimes to ask about a particularly large cluster of memorial crosses (bus crashes) or to snack or take a photo of the spectacular scenery. It has to be one of the most beautiful roads I’ve ever been on, even if it reminds me of another frightening route we made in Kashmir. 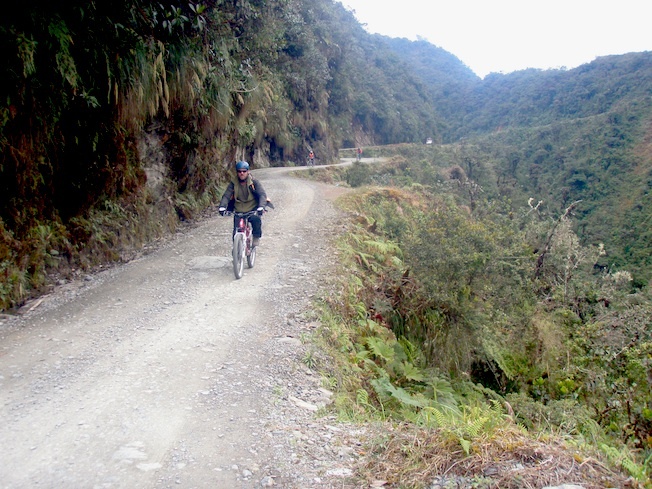 Before long, and certainly before I’ve got my BMX skills, the tarmac ends and we’re faced with the true Death Road: a narrow track of stones, dust and slippery gravel that’s lined with extreme drop-offs. 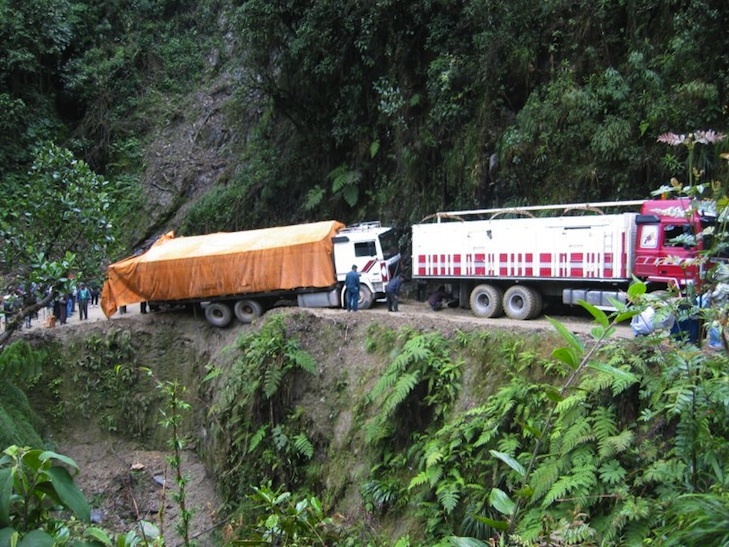 One wrong move, one slip on a rock or dodgy turn and the consequences are fatal. In places, the drop is more than a kilometre. I’m told that fewer than 30 cycling tourists have died here (10 have been Israelis), but we know of one 28-year-old Israeli woman who cycled off the edge in fog in April, and passing the spot where she died is a chilly moment for us all. It doesn’t take Nick long to get used to the new road conditions, but I remain nervous and slow. As we descend, splashing through rivers and waterfalls that cascade from above, the scenery becomes greener, more tropical and noticeably warmer. We happily remove layers and I begin to enjoy the lower altitude and first warmth for a month or so. Ravines reveal the enormous valley separating the Amazon jungle from the dry high of La Paz. Trucks and cars pass us in both directions – each time, it’s newly terrifying for me, but I learn to pull over, to not step back (like the unfortunate French woman of earlier this year) and then wait for their fumes and dust to settle before continuing. 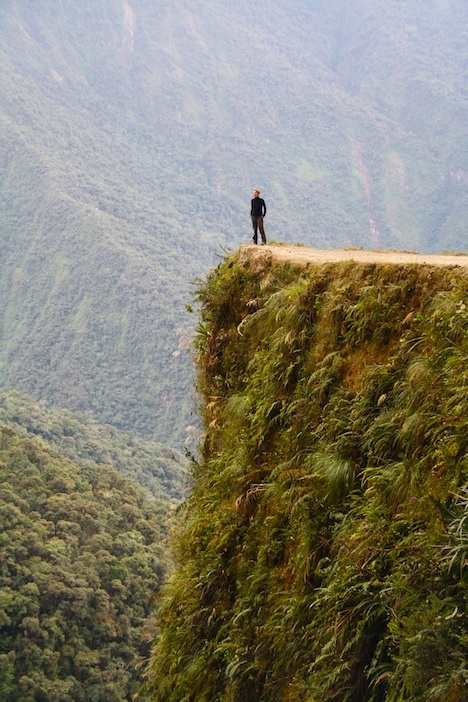 Unlike everywhere else in Bolivia, the Death Road is left-hand-drive, the reasoning being that if you descend with nothing but empty suicide on your left, you’re more likely to slow down. 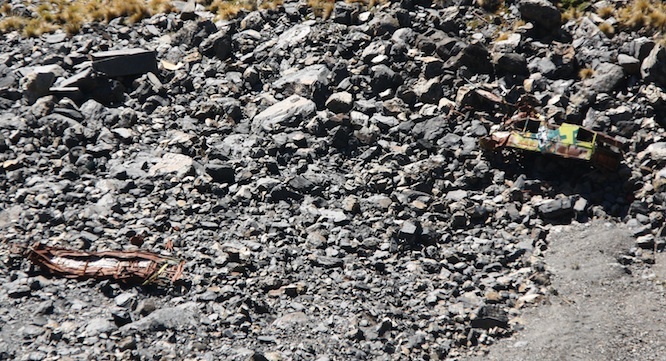 At the bottom of the 4000 metre mountain, we reach a small stream and the end of our journey. 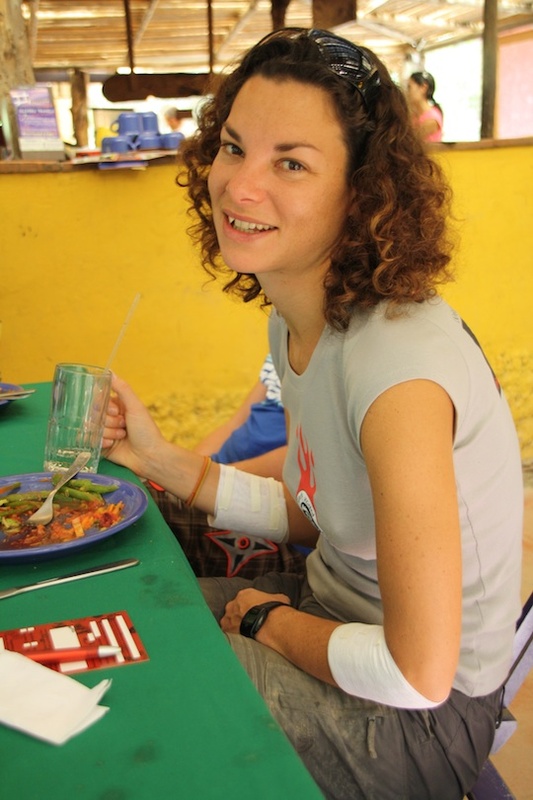 We get given a T-shirt, usefully because I ruined mine with my road belly-flop, and an enormous sense of relief. Gaia, You could be describing me on a bike, that’s exactly how I am too. I can barely pedal around my tiny neighborhood. I would never in a million years go down this road. You are so awesome! And what a descriptive tale! A great addition to your blog! Rob and I had a really great time on the road – couldn’t stop smiling for hours afterward – then collapsed back at the hostel from exhaustion…thanks for the tip re. 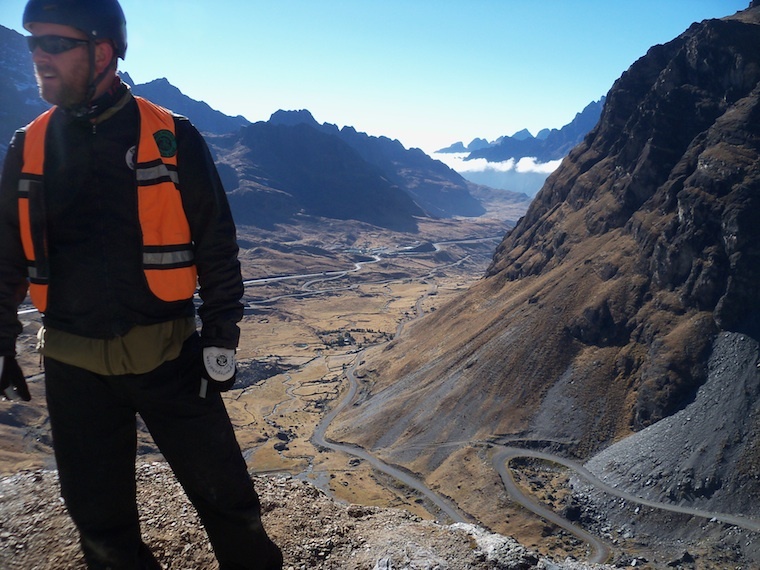 extra pair of gloves…saved my life – well my fingers anyway! Happy travels. Maybe bump into you soon! Excellent! Glad to hear there were no accidents. It is so beautiful, isn´t it.